This post is for Kim, aka Black Swamp Girl, blogging @ “A Study in Contrasts” who, by the way, has some of the loveliest photography- I am green with envy over that! Not so good way to be green;). 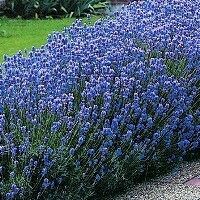 She indicated an interest in the how-to of making starts of lavender. There is the “best way” and the way I do it- which is the lazy way. The “lazy way” means you might not worry about losing a little if you don’t watch it carefully or take too much trouble. First, the easy, lazy way and then I’ll look up some stuff for the official recommendations. My way consists of taking the green cuttings in the spring, I have also done ground layering, and that works quite well. This also works for dianthus, by the way. After the lavender plant takes off a bit in the spring- around the time it starts to bloom, take cuttings from the new growth… I like to have about six to eight inch pieces and bury about half of that length. I simply press the buried part into some cultivated earth and cover it with a piece of rock. Make sure the cuttings get even moisture at the beginning. Sometimes I cover them to protect from the sun and wind, but not always. Like I say, this method will have some loss. The more careful with the moisture attention and protection, the greater the success. Layering involves a full grown plant in the garden. (This is how I first grew my lavender starts.) From the side of the plant you use a long stem ( don’t cut) nick it a bit where it connects with the ground. Lay it down with a few inches of soil over it, place a weight like a garden rock on it. That is it. It roots after sometime, and you can then disconnect it from the mother plant and pot it up or transplant it elsewhere. This is very easy since the mother plant keeps it growing strong through the rooting process. As long as you do start your plants before the heat of summer you have good success here in Ohio, because our spring conditions are good for growth with plenty of moisture and many cloudy days (always helpful when starting new young plants). Here are the official steps from a delightful gardening site,”No Thyme Productions”, Growing from Cuttings. [The same page has seed starting directions and tips!!] As you can tell by this beginning advice:”use a container that is new or has been sterilized with 1 part bleach to nine parts water.” it is much more complex than mine, and is likely the way to go if you want high percentage of success. 1. Pick a plant that is healthy and vigorous. One that looks at you and says “I love growing and I’m so fabulous there should be more of me”. 2. Choose stems that are coming out of the sides of the plant not in the middle. I used to know the reason why, but that bit of knowledge is at present irretrievable. Side shoots root faster. 3. You want a cutting no more than 3″. Bigger is not better! Strip the leaves off the bottom ½ to 2/3 of the cutting. If you can do this with your fingers it is preferable to using a scissors. You want enough leaves for the plant to be able to make food but not too many so that it can’t concentrate on growing roots. If the plant is flowering (not an ideal time to propagate but it can be done) cut off all the flowering buds. You don’t want its energy directed there. 4. Make the final cut it a node (an intersection where one or more leaves jut out of the stem) because there is more growth hormone at that site. If you can make the cut at an angle, more of the stem will be exposed to start to root. I don’t use extra growth hormone powder, most growers don’t. You have more chance of killing the cutting with it. If there is already enough hormone in site, adding more puts the plant into a tailspin. 5. Firm the cutting into your growing medium (there should be no leaves touching the medium) and put some clean plastic over the top forming a mini-greenhouse. As you can see I do it very differently, but I do look for vigorous growth on the mother plant. I use more length because of direct planting outside in conditions where such a small cutting would soon dry out. The biggest mistake I ever make is timing- you can’t wait until summer because then it is too hard to keep the cuttings moist. You can still try the layering, however. One thing I was always going to try was rooting hormone, but never got around to it. I would probably use that for something like growing starts of heliotrope for the season. At present, I have to buy new plants to try to get heliotrope back into my garden plantings! I’m telling you – I love heliotrope! and I can’t think of a more heavenly combination than heliotrope, lavender, and deep purple petunias. Fragrance harmonious purples and plant contrasts. It sound like the base for a container combination, doesn’t it? I think it would need another color to punch it up a bit- maybe a pinkish diascia or something to spill out, or white lobelia for the subtle among us. A variegated spiky thing would look good too…. or to keep the herbal theme and fragrance…lemon variegated thyme…ooooooh. I am so psyched for Spring!